Moscow’s outreach to ASEAN also helped the grouping improve ties with Vietnam, Laos and Cambodia, eventually accepting them as members. Southeast Asia was hotly contested throughout the days of the Cold War, and the Soviet Union clearly was the victor in Indochina and Myanmar, but had little influence in countries that chose to be allied with the United States. While countries like Laos, Vietnam and Cambodia had a very strong Russian presence, officials, specialists and tourists from the USSR were conspicuous by their absence in countries like Thailand, Philippines, Singapore and, to an extent, Malaysia. In the era of Perestroika and Glasnost, Mikhail Gorbachev realized the importance of reaching out to Southeast Asian countries that were on the other side of the Cold War spectrum. Alexei Dudnik, a historian based in Moscow, says Gorbachev realized that there was a great opportunity in increasing economic ties with the Asian tigers, but understood that the Russians were viewed with a great deal of suspicion. Gorbachev was also looking at disarmament at a time when it was looking clear that Moscow could not outspend Washington in the arms race. “The Soviet Union aspires to the radical reduction of armed forces and conventional weapons in Asia up to the point of reasonable- sufficiency,” he said. With this statement came a serious reduction in defense aid to Moscow’s allies in Southeast Asia. Gorbachev realized that the only way to remove suspicion of Moscow among ASEAN members was to help improve ties between the Indochinese countries (Laos, Vietnam and Cambodia) and the Southeast Asian grouping. In his 1986 speech in Vladivostok, Gorbachev called for the “establishment of mutually acceptable relations between the countries of Indochina and ASEAN.” One of the biggest obstacles at that time was the political situation in Cambodia. The world was sharply divided over the Vietnamese occupation of the country and the legal status of the government in Phnom Penh. “Gorbachev’s desire to reach out to Thailand and Malaysia, may have been a key reason that the Soviet Union took the initiative on Cambodian reconciliation,” Dudnik says. By the mid-1990s, Vietnam and Laos joined ASEAN, while Cambodia became a member in 1999. When restrictions on international travel were reduced in the Soviet Union, a large number of Russians started visiting new and exotic destinations in Southeast Asia. Many of the initial visitors were shuttle traders but as Russia’s economy started to grow, wealthier tourists and businessmen began to set up shopsin places such as Thailand. With increased people-to-people contact, Russia’s relations with ASEAN countries began to blossom. Malaysia took the initiative in 1991 by inviting Russia to attend the ASEAN Ministerial meeting. The ASEAN-Russia dialogue was launched at the meeting. “Russia’s ASEAN outreach was the first in a series of steps towards a greater relationship with Asia,” Dudnik adds. In 1998, Russia became a member of APEC and 14 years later, it was a spruced-up, restored and redeveloped Vladivostok that hosted a summit of the Asia-Pacific gathering. 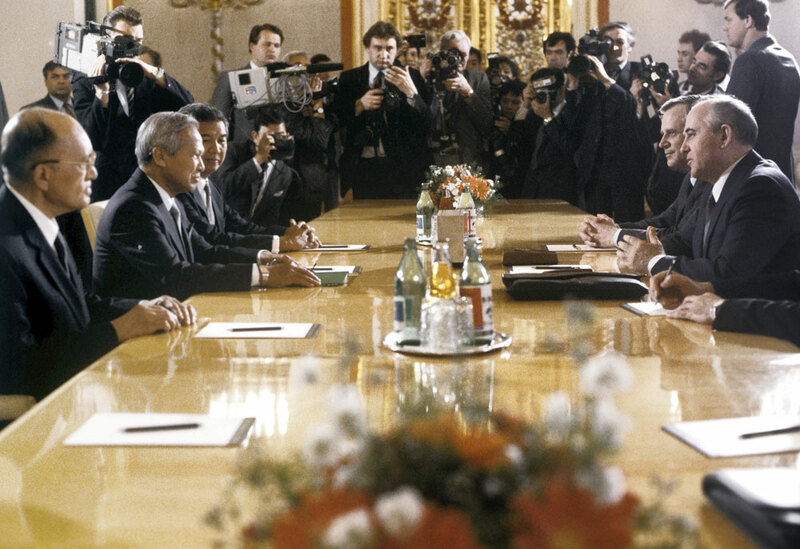 “The current level of trade, diplomatic ties and cultural engagement between Russia and the Asia-Pacific was exactly what Gorbachev envisioned in the mid-1980s,” says Dudnik. As Russia hosts the heads of state of each ASEAN member in May in Sochi for the 20th Russia-ASEAN summit, Moscow is expected to push for the status of an ASEAN Strategic Partner, a privilege enjoyed by countries such as the U.S. and India at the moment.